 Mouse anti Human CD300a antibody, clone MEM-260 recognizes human CD300a, otherwise known as IRp60 or inhibitory receptor protein 60, CD300a is a ~60 kDa transmembrane glycoprotein expressed by natural killer cells (NK), T and B cell subsets, monocytes, neutrophils, macrophages, granulocytes, dendritic cells (DC) and mast cells. Cross-linking of CD300a on NK results in a down-regulation of their cytolytic activity, whilst cross-linking of CD300a on mast cells, inhibits IgE-induced degranulation and SCF-mediated survival. Furthermore, cross-linking of CD300a on the surface of eosinophils has been shown to significantly inhibit their survival, chemotaxis and activation in response to certain inflammatory cytokines, whilst eosinophil-derived MBP (major basic protein) and EDN (neurotoxin), can down-regulate CD300a expression on mast cells in vitro (http://www.ncbi.nlm.nih.gov/pubmed/16339535). Human HPB acute lymphoid leukaemia cell line. MCA2704GA detects a band of approximately 60kDa in HPB cell lysates under non-reducing conditions. Sabato, V. et al. (2012) CD300a is expressed on human basophils and seems to inhibit IgE/FcεRI-dependent anaphylactic degranulation. Cytometry B Clin Cytom. 82 (3): 132-8. Kim, E.J. et al. (2012) CD300a and CD300f differentially regulate the MyD88 and TRIF-mediated TLR signalling pathways through activation of SHP-1 and/or SHP-2 in human monocytic cell lines. Bachelet, I. et al. (2005) The inhibitory receptor IRp60 (CD300a) is expressed and functional on human mast cells. J Immunol. 175 (12): 7989-95.